My Christmas decorations went up yesterday, the earliest I've ever put them up, and today I made Uma Wylde's Spiced Cranberry Relish it was really easy to make, I made four times the recipe using 600g of fresh cranberries. Of course I had to have a little taste and it is delicious, not too sweet and lovely spicy flavours. I also made some Shortbread Biscuits. My mum makes these every Christmas, she used to make up a box full for my Grandpa who really loved them. I usually make them too as they are easy to make and melt in your mouth. Here is the recipe I use, you must use butter it's what makes the shortbread so delicious. 1. Sift the flour into a bowl and add the sugar. Work in the butter with your fingertips - keep it in one piece and gradually work in the dry ingredients. Knead well. 2. Pat down on a work surface and use a rolling pin to roll the dough to about 1/2 cm (1/8 in) and cut out with a cookie cutter. You will probably have to keep pushing the dough back together again as it is very crumbly. 3. Slide the cut biscuits off the work surface with a knife and onto a baking sheet. 4. Bake in the oven at 170C (325F) Mark 3 for about 8 minutes until firm and pale golden brown. 5. Lift onto a cooling tray with a spatula and dredge with caster (superfine) sugar. Oh, I'm having a baking day on Saturday... all this talk of delicious shortbread... and people making gingerbread... I just want to bake! That all looks scrumptious Janice! Is the cranberry relish intended as a sweet thing or to have with your roast? I made it for the Turkey, but Uma also recommends it with Brie on little croute thingies. oh your shortbread biscuits look fabulous! That cranberry relish sounds really tasty as well! I bet it's fab with turkey! By the way, how do you keep your shortbread fresh when giving it away as presents? It's all looking lovely and Christmasy, but it's scaring me. All my best laid plans have gone out the window and I don't know if I'll have time to make anything now - aghhhh! Thanks for your reply Janice. I guess I was meaning how do you present it as presents if it could be a few days between making and giving or giving and opening? I've never made biscuits as presents because I'm never quite sure what to do. You were talking about giving a box of shortbread????? Both look really good. I am going to have a go at making my own cranberry sauce this year but I can't decide on a recipe. I am thinking of making one a head and freezing it and then heating it up on Christmas morning to save time. I just have to figure out which recipe will work best for that and taste good too. Oh, yes, it is beginning to look a lot like Christmas at your place. A yummy Christmas at that. I am posting a shortbread cookie tomorrow from my participation with Cooking With Dorie. They are similar to yours. 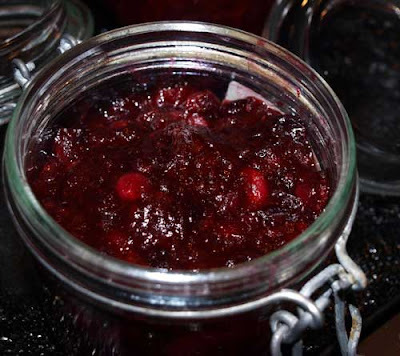 You have your Christmas decor up, you baked shortbread cookies and prepared a delightful cranberry relish. If I bring a big pot of tea and coffee, can I join you to enjoy the decorations and the holiday treats? I absolutely love the vibrancy of the relish! Shortbread biscuits look lovely too. Thanks for the tip Janice. I had been thinking along those lines, but wasn't sure where to get the bags from. 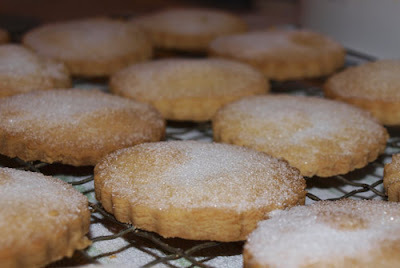 Will be making my Shortbread Biscuits for christmas too - think they were my second post on my blog! I would love to sample some of that shortbread. :) Looks wonderful. Your post has me in the mood for holiday baking. Cute blog! Love the pic of the relish, I make it almost the same but never thought to put it over cheese mmmm! Thanks for the inspiration!